Posh midfieldeer Jamie Walker on the attach against Fleetwood. Photo: Joe Dent/theposh.com. Peterborough United manager Steve Evans dedicated tonight’s (October 23) crucial 1-0 home win over Fleetwood at the ABAX Stadium to the club’s supporters. A second-half header from central defender Rhys Bennett secured a first win in six home League One matches in front of 5,347 fans, the lowest ABAX crowd of the campaign. 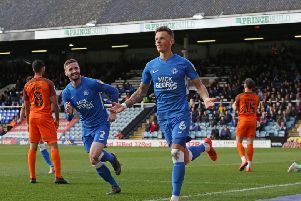 Posh hadn’t won at the ABAX since beating Luton 3-1 on August 18. Ivan Toney in acrobatic action for Posh against Fleetwood. Photo: David Lowndes. The win kept Posh second in the table, four points behind leaders Portsmouth who were held 2-2 at Fratton Park by Burton Albion. Posh visit improving Burton on Saturday (October 30). Evans made four changes to his starting line-up, leaving top scorers Matt Godden and Jason Cummings on the substitutes’ bench, while handing midfielder Louis Reed his first start in a Posh shirt in a Football League match. Reed created the only goal with a well struck corner. “That win was for the supporters,” Evans announced. “It’s a thank you for sticking with us during a torrid run of home results. “We lost in front of them on Saturday and yet the turnout for a Tuesday night game wasn’t bad at all. And their support was fantastic in the final 20 minutes. We deserved to win, but there’s no doubt the fans helped us get over the line. Posh manager Steve Evans is interviewed by Sky Television before the game against Fleetwood. Photo: Joe Dent/theposh.com. “For a team that is still second in the table and averaging two points a game we have been smashed by criticism, but the level of support during games has been exceptional. “And I think our fans saw a team tonight that is determined to win games and be successful. They rolled their sleeves up. They were full of effort and endeavour and picked up a good result against a very good Fleetwood side. “We were brave in our selection. We went back to the formation that we used when we lost heavily at home against Barnsley, but the service to the forwards was much better tonight. There were many more players willing to make runs in support of Ivan Toney up top. “We had to find a way of winning at home. We have tried to play the same way which has been successful away from home, but it hasn’t worked. Siriki Dembele on the ball for Posh against Fleetwood. Photo: David Lowndes. “We kept possession much better tonight and played plenty of good stuff. We have to dominate the ball more at home and this was a good start. “I was disappointed not to be in front at half time, but we were let down by our final ball. It was all a bit nervy until we took the lead, but we then could have scored more. We had a goal wrongly ruled out for offside and other good positions came and went. “Louis Reed was our best player for me, while Jamie Walker was sensational for 30 minutes of the second half. “Neither has had much football this season. We’ve tried to keep them fit, but nothing replicates competitive action. “And we were resolute at the back. When it’s only 1-0 the opposition is always be in with a chance, especially when they have good players. Evans made a first change to his starting back four of the season with Jason Naismith replaced by Joe Ward at right-back. He will have to make another change as left-back Colin Daniel picked up his fifth caution of the season tonight and is now suspended from the game at Burton.